One by one, the adventures from GOLDEN AGE ADVENTURES are being republished as individual one-shot modules for the low price of $1.99 each! These roleplaying adventures are based on "Golden Age" stories by well-known science fiction writers of the 1930s-50s. Each adventure comes with three scenarios, allowing them to be easily dropped in to any science fiction roleplaying campaign. 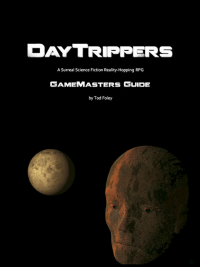 As with all DayTrippers products, conversion tables are provided for use with other game systems, including d20 and "Powered by the Apocalypse" systems. The PCs travel to the survey station Perdurabo: a mobile space laboratory in orbit around a stellar black hole. Their mission is to perform a series of temporal resistance experiments just outside the Event Horizon – a dangerously near approach that has never been attempted. BLACK HOLE RUN is a DayTrippers adventure module for 2-6 players. Rich in SF tropes and interstellar curiosities, this future science adventure will test your players' tactical and problem-solving skills in a dangerous and chaotic environment. Convertible to Your Game System! 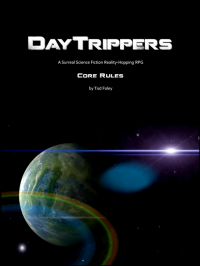 All DayTrippers products and modules include conversion tables for use with other game systems, including d20, d100, and "Powered by the Apocalypse" systems.